Two weeks ago was my not-boss's birthday (he wasn't my boss, but answered all of our silly intern questions). Hes that guy in the office who managed to get nerf guns banned, so I needed to come up with something fitting for his birthday. Luckily, in my many years of digging through surplus stores, I knew exactly what I wanted to get him, and exactly which bin it has sat in at Weird Stuff. That's right. A cross walk signal. A real, genuine, GE crosswalk signal. But, a crosswalk signal by itself wouldn't have been good enough, so I decided to add a simple microcontroller circuit to it to emulate the standard crosswalk signal pattern. In the picture, the green board on top is the original power supply / LED driver that came with the sign, and the tan board below it is the part I added. The second tan board to the left is a scrap 5V supply I had sitting around to save myself the trouble of building it from components. Shown in the picture is my USBtinyISP hanging off the board for development. 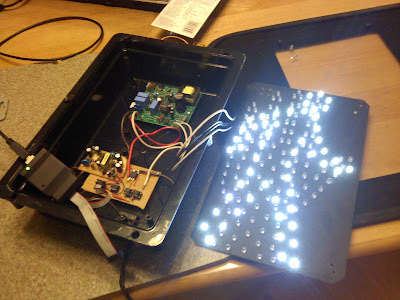 One thing I found very surprising about the LED driver that came with the sign was that it was not just two separate LED drivers for the walk and stop signals. One of the two lines was power for the entire sign, and the second line was a latch that switched from the hand to the walk signal. This means to go from the hand to the walk only requires pulsing the latch line, but there is no way to go from the walk signal back to the hand without completely removing power from the sign (watch a walk signal the next time you're out; you'll see that it always turns the walk off, then starts blinking the hand.). Hi Kenneth, great post! I also bought a crosswalk signal, but mine is an older one with 2 separate 120V bulbs (like this http://66.99.250.178/services/public_works/engineering/traffic/ped/ped1.jpg) No logic controller was inside the housing. Any recommendations on where to start? I understand all your logic for controllers, just not sure how I would use it to control a higher voltage. Thanks! My circuit is already set up to switch 120V, so really, your case is simpler because you don't need to out-smart the on-board logic. Just copy the upper 120VAC switching circuit for both bulbs. I picked up a couple of these yesterday from Weird Stuff and mine (at least the one I'm playing with right now) seem to be different than yours. The red wire simply controls the hand and the brown controls the man. Trying to use one as power and the other as a latch started to make the magic smoke come out. Mine only wants one of them hot at a time.